"Tens-Kwau-Ta-Waw, the prophet," published in 1838. 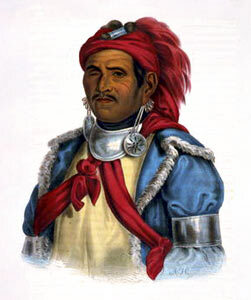 Hand-colored lithograph from McKenney & Hall's History of the Indian Tribes of North America, based on a painting by Charles Bird King after the 1823 sketch of James Otto Lewis. Library of Congress, Prints and Photographs Division, LC-USZCN4-115. Tecumseh's twin brother, Tenskwatawa, sparked the religious revival that accompanied Tecumseh's political movement. In 1805, the brother claimed that a vision from the Indian god had inspired him to denounce superstition, witchcraft, intermarriage with whites, alcohol, and assimilation of white technology and ways. Changing his name to Tenskwatawa, meaning "The Open Door" or "The Prophet," he sparked a spiritual revival that coincided with his brother Tecumseh's attempts to form a pan-Indian confederacy. Tenskwatawa's influence diminished after Harrison defeated his followers at Tippecanoe (1811). Tenskwatawa passed the rest of his life in Canada as a British citizen. Many of his and Tecumseh's followers sided with the British in the War of 1812. Tecumseh's dream of a pan-Indian alliance founds its most vibrant expressions in the Seminole confederacy -- both in Florida and in the climactic events of 1850 in the Indian Territory. His youth coincided with a period of nativist revival that strongly influenced his political views. After 1805, the ideas of Tecumseh and his brother Tenskwatawa sparked a return to Indian traditions and a renewed militancy against white culture. Starting in Ohio, Tecumseh's movement spread far to the north but found its principal expression in Alabama and then in Florida. In his adolescence, Osceola became an initiate of the revivalists. In this, he was surely influenced by the dominant event of his childhood, the Creek War (1813-14).